The products you can buy to support a gardening "habit" are endless. But here's one that might be worth your while. If you are thinking of starting seeds indoors ahead of the growing season to save money and time, consider investing in one or more heat mats. They can really help you speed up seed germination when nothing else will. For example, one Kids Garden Club went outside in early spring to collect seedheads of the popular white wildflower, Queen Anne's Lace. Then they crushed the seedheads, collected the tiny seeds - not much larger than the period at the end of this sentence - and ever so carefully dropped one in each cell of a seed-starting flat. They put it on top of a dryer in a warm laundry room, awaiting germination so that the sprouts could go under grow lights. Days passed. Within three days, seedlings in two other flats had sprouted and moved to the lights. But the soil around the Queen Anne's Lace seeds remained cold and damp. More days passed. Still nothing! The club pointed a space heater toward the flat, hoping that the warmed-up soil would make the seeds respond. They ran damp towels in the dryer almost constantly, hoping the warmth from below would seep up into the soil and wake up those seeds. Another week passed like that. No luck! Finally, the club leader remembered that deep in the bowels of the garage, she had a box with two seed mats. They are said to raise the soil temperature by 10 to 20 degrees, simulating mid-spring warm sunshine. Maybe they would help! The kids rigged up a heat mat under the flat with the Queen Anne's Lace. Voila! 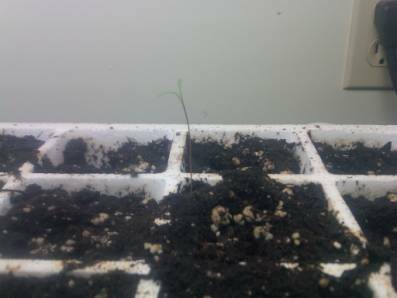 In only two days, the first two sprouts reached for the sky! The club is researching whether Queen Anne's Lace seeds simply take more days in contact with the soil to germinate . . . or whether the heat mat really was the solution. The cost can be an impediment, though: a heat mat may cost $35 or more in a garden center. That's the bad news. The GOOD news is, if you do the math, you can see that a seed mat may end up paying for itself in just one or two years. How? Let's say you spend about $20 for seeds, organic seed-starting medium, a flat and a grow light. From this, you sprout two seeds in each of the 24 cells, for a total of 48 plants. If you bought those seedlings at a garden center, you would likely spend a dollar or more per plant - let's say $50 for 48 seedlings, a pretty inexpensive price. Your costs, even with a seedmat, are $55 this year - a little more - but NEXT year, since the seedmat is already purchased, your costs would drop to $20 for the same 48 plants. That's 2½ times LESS than at the garden center! 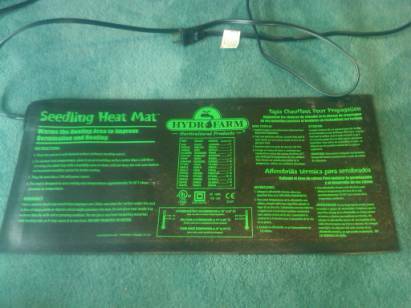 So a heat mat might be the answer for those mid- to late-spring germinating seeds. And, as the kids say, anything that saves money and makes you a more efficient gardener is a . . . hot prospect.